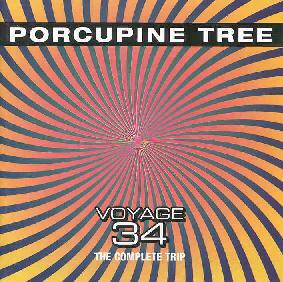 Porcupine Tree - "Voyage 34, The Complete Trip"
Hey, stop bidding on Ebay! It's out! The two Voyage 34 EP's that Delerium released many moons ago have been heavily sought after for quite some time now, and as promised (better late than never) here is the reissue CD containing both original EP's, i.e., all four 'phases' totalling just over an hour. Not having the originals myself, I can't say if the artwork is true to the original, but I can say it's very nicely done and includes all of the voice-over commentary of Brian's fateful 'trip.' It also includes a wild photo collage of rows of teeth that is disturbing enough to scare me off ever taking LSD if that's the kind of thing I might hallucinate on a bad trip. Yikes! The 13-minute Phase I is pretty much the track that I'm used to from the Pick 'n' Mix version and the band's live performances. Arguably, it's pretty uneventful for much of it, alternating between the repetitive krautrockish riff and the narration bits, but the teasing pays off when Steve Wilson's fabulous guitar solo finally breaks through. Phase II of the trip begins quietly with more commentary by the male voice and some candid remarks from a female 'subject.' An echoed electronic beat and soothing atmospheric noises alone make up the music, until about five minutes in when the looping guitar riff kicks in over a trancey backdrop. Not exactly the same as before... kinda sounds a bit like "Moonloop" here actually. Later on, it morphs back into an alternate version of the ending of Phase I, a different guitar jam this time. And another good one. Phase III is considered a 'remix' with assistance from Swordfish from the 'band' Astralasia, who have done similar things with Hawkwind tracks in the past. At nearly 20 minutes, Phase III dilly-dallies around quite a lot, opening with a good seven minutes of pleasant but stagnant ambient-space. The mildly accentuated beat that then permeates (much) of the remainder of the track is harmless though hardly creative, and the extra layer of electronic hi-hat is pretty darn tedious. Let's face it - I just don't like techno remixes. Thumbs down. Richard Barbieri was around in 1983 to contribute his synthesizer tapestries to Phase IV. A more artistic form of pure ambience, the listener is treated to a perpetual 'fuzzy' heartbeat, the sounds of faux seagulls, and the subtle guitar statements of Mr. Wilson. You can't really compare this hour-long work with any other Porcupine Tree album full of songs…it's really still just an EP of one big idea, stretched out to an exorbitant length. Because I already essentially have Phase I elsewhere, my rationale for holding onto this is mainly Phase II (and the cool booklet). So I don't see any other conclusion than to say it's been seriously overhyped, even though I freely admit I really like the basic tune, repetitive as it is. So this release will at least succeed in one way... it will eventually lead to the public's desire for Voyage 34 being based on its own merit, not its availability (or collectability).